In his first few months as senior pastor of Saint Mark United Methodist Church in Wichita, the Rev. Robert Johnson is already getting down to business. But he’s also backing away from what he calls the “busy-ness” that’s bogging down the largest African-American congregation in the Great Plains. “What does God want us to do very well? Let’s do those things,” Johnson told parishioners at a town hall meeting. “Too many programs on top of programs, projects on top of projects. “Backing off the busy-ness could have a big impact,” he added. Johnson began at Saint Mark in mid-August, replacing the Rev. Junius Dotson, who was the church’s senior pastor for 14 years before being named in April as general secretary of Discipleship Ministries of The United Methodist Church, based in Nashville, Tennessee. The 50-year-old is already familiar with Saint Mark and with Dotson. Johnson was twice a guest speaker at the Wichita church, most recently this spring when he was courted for the job in Kansas before ultimately being hired by then-Great Plains Bishop Scott Jones. Likewise, he’s familiar with his predecessor: He and Dotson both attended Perkins School of Theology at Southern Methodist University in Dallas at the same time. But Johnson says he differs in styles from his longtime friend. “Junius is more of a CEO, corporate style of leadership,” Johnson said. “My natural DNA is more relational. Some people call it older-fashioned style of leadership. Even though the attendance at the two Saint Mark campuses is near 1,000 people a week, Johnson said it’s still possible to develop individual relationships. “You can’t with everybody, but if you have relationships with your circle of influence, that will spread to others,” he said. Robert Johnson was born and grew up in Columbia, Mississippi, a city of 6,000-plus near the Gulf Coast. His church was socially active, starting the first Head Start program in the area and blooming into a multifaceted social service organization, building homes for the low-income and senior citizens in the area. It had a $10 million budget by the time Johnson graduated college. At 16, he “embraced the call” to ministry, and began speaking at youth gatherings through his time as a student at the University of Southern Mississippi. While at college, he began embracing different denominations and their methods of calling pastors. It bothered him that the Missionary Baptists had their pastors accept the call one week and installed and ordained them at a church the next. A United Methodist pastor who was mentoring him convinced him to change denominations. “Not only do we believe, we affirm our pastors being educated. It’s a requirement,” Johnson was told. “That was it for me,” he said. Johnson served for 10 years as associate pastor of Windsor Village United Methodist Church, a Houston powerhouse congregation whose pastor, the Rev. Kirbyjon Caldwell, is nationally recognized as well as being a spiritual adviser to President George W. Bush. Caldwell even gave the video introduction of Johnson’s appointment in June. In 2014, he was appointed as senior pastor of Aldersgate United Methodist Church in College Station, Texas, the first time he’d led a church that wasn’t predominately African-American. Johnson counts Saint Mark – along with churches in Dallas, Houston and Atlanta – as one of a handful of flagship African-American United Methodist churches in the country. And while Johnson wants to keep Saint Mark’s reputation intact, he also says that diversification is the key to strengthening and building the church. The response to his ideas: “So far, so good,” Johnson said. Johnson said he also wants to reach out to more millennials, and part of the way to do that is for Saint Mark to become more active in social media. Until someone is hired to do that, Johnson is managing its Facebook and Instagram accounts. African-American millennials, he said, want something different from church than previous generations. “We’ve got to add an additional worship or change things about the way we worship, especially with young African-American folks tend to be drawn to less volume, less performance and more into what they call authentic worship,” Johnson said. “Their reaction is, ‘I want a church that doesn’t look polished, that doesn’t feel like everything is scripted out and planned,’” he added. 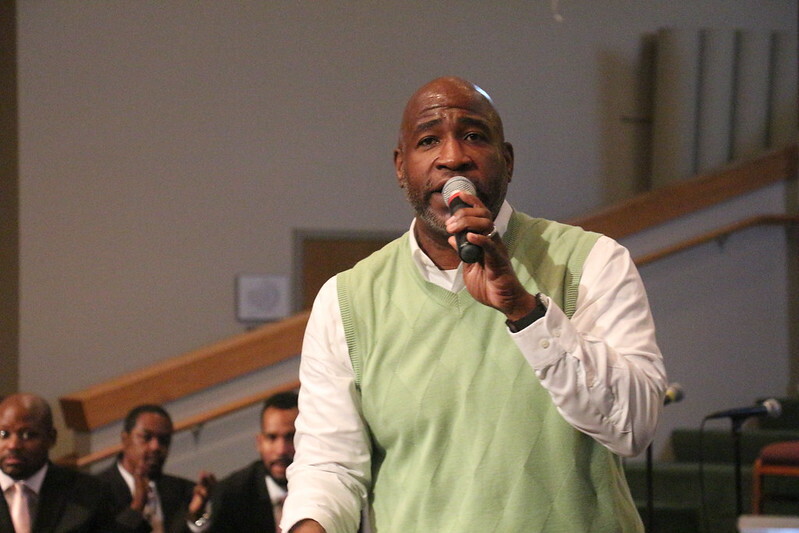 Johnson – who already has dropped “The Dark Knight” and a quote from rapper Tupac Shakur into his sermons – says that dynamic worship has already been a strength of Saint Mark, as has its E.C. Tyree Health & Dental Clinic, its health and wellness ministry that has served more than 10,000 low-income patients since its opening more than 30 years ago. But he also sees duplications of programs and services that stretch both the staff and congregational volunteers too thin. There has been some reluctance to the plans, Johnson said, but he’s trying to stem any negativity. Those worshipping at Saint Mark’s southeast campus, the result of a 2013 unification with the former Epworth United Methodist Church in Wichita, are enthusiastic about Johnson’s preaching style and his plans for the church. “There’s an anointing on him that’s like fire,” churchgoer Rita Williams said. “He’s got a newness and creativity, an openness for the extraordinary and the unordinary people who might come. “He’s making it a place for everybody, no matter who you are or where you’ve been,” she added. Sheldon Guilford, who was holding the door open and greeting churchgoers as they left the services, is also pleased with what he’s seen from the new pastor. The Rev. Mitch Reece, Wichita East District superintendent, said Johnson arrived in Wichita with a reputation as being an innovator and change-maker. Johnson’s wife, Linda, is a senior financial manager for Shell Oil. When she explained that her husband would have to move and offered her retirement after 28 years at Shell, she was urged to stay on and telecommute, checking in to the Houston office in person once a quarter. Johnson’s life took a change a few years ago, when he was feeling a bit nauseated and had a small blackout. After lab tests, he was told he had suffered three mini-strokes. “Unless you looked at the MRI, there was nothing about my appearance to indicate that I had a stroke,” he said. Johnson saw that as a wakeup call, resulting in a change in his attitude. “The people who know me know I love to laugh a lot and have fun. I don’t take myself too seriously,” he said. “I refuse to let us take ourselves too seriously. This (job) ain’t that serious.